Burnley have signed six young players to bolster their Under 23 squad. Josh Benson, Mace Goodridge, Rob Harker, Teddy Perkins, Ed Cook and Anthony Glennon have all agreed contracts, which started on July 1st. The 18-year-olds all featured for Michael Duff’s young charges towards the end of last season, as the Clarets produced a strong finish to the campaign to climb away from bottom spot in their debut U23 Professional Development League campaign. And Duff said: “We are delighted to have all of them on board and ready to start pre-season with us. “They all made an impact last season with the different playing opportunities they had and in their time training with us so far, and I feel they will definitely strengthen the squad this time around. “We are trying to increase the quality across the board with our young players, through recruitment, coaching and the experience of playing competitive football, and adding these players will do that. “They come from a variety of backgrounds and different levels of football – from Premier League clubs down to the lower divisions and even schools’ football in the case of Ed. Harker joins the Clarets after leaving Bury, where he made one senior appearance as a substitute in the Football League Trophy last season. 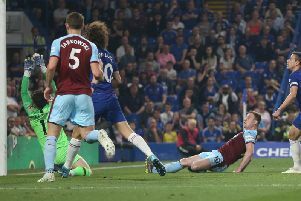 The striker scored in Burnley’s final-day Development League win at Sheffield Wednesday, which denied the Owls the northern division title and a place in the national play-offs, and then netted twice in a friendly win at Rangers in May. Creative midfielder Benson, who was released by Arsenal at the end of a two-year scholarship with the Gunners, played a handful of games in the league and behind closed doors for the Clarets towards the end of last season. And he was joined by former Manchester City youngster Goodridge, who also plays in central midfield, and who moves to Turf Moor after leaving Newcastle United. Perkins and Cook are both centre-backs, with Glennon a left-sided defender. Perkins has been training with the Clarets for a number of months and played in several games since being told by Leyton Orient that he would not be offered a professional contract at Brisbane Road. He had previously captained the O’s youth team and been given a senior squad number. Cook, who scored the winner in the Clarets’ U23 Development League win over Crewe, and also made an appearance for the Under 18s during a trial spell in April, has signed a deal after ending his studies at Bradfield College in Berkshire. He has represented the Independent Schools’ Association at Under 16 and Under 18 level. And Glennon joins the Clarets after ending a lengthy association with Liverpool. The Bootle-born left-back had been in the Academy set-up at Liverpool from under six level after playing alongside current Liverpool and England defender Trent Alexander-Arnold for club side Croxteth Park. Last season he played under Liverpool legend Steven Gerrard in the Reds’ Under 18 side.